Pumpkin peanut butter fudge – a rich and creamy peanut butter fudge, with a pumpkin flavor that just sets it off completely! Is there anything better than peanut butter fudge? 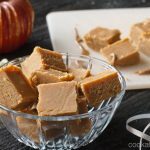 Well, around the Thanksgiving/Christmas season there are SO many recipes around that include pumpkin, so when I found this recipe for a combination of peanut butter fudge AND pumpkin, I just had to try it. I took some into work and one of the guys said it was like ‘jonesing’ – he just wanted to keep eating and eating it! I adapted this recipe from the original by doubling the amount of peanut butter in it … but that might be just because of how much I LOVE peanut butter! My husband now wants me to keep the amazing taste of it, but use marshmallow cream to get even more of a fudgey texture. Wish me luck! 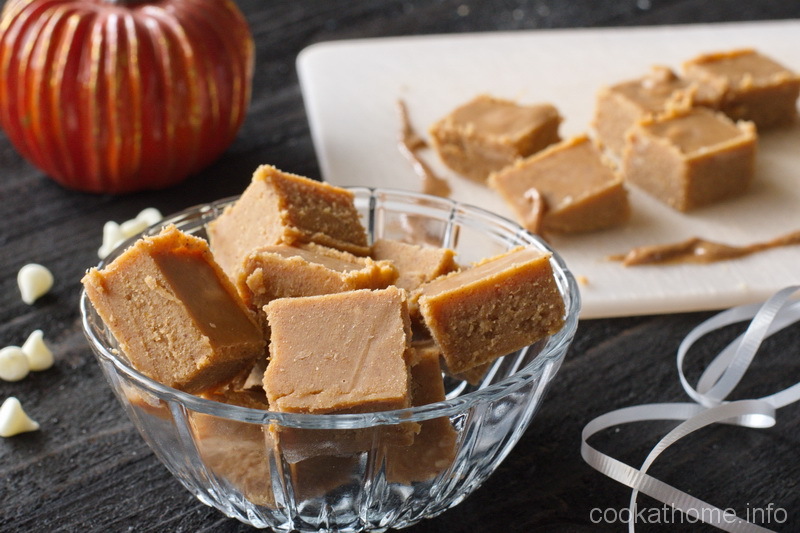 Try this pumpkin peanut butter fudge – you’ll see what he’s talking about! Line an 8 x 8" pan with parchment paper. Place white chocolate and peanut butter in a large microwave safe bowl. Heat on 50% power for 1 minute. Stir then continue heating at 50% for 30 second increments, stirring between each, until melted and smooth. Remove from heat and immediately stir in the pumpkin puree, spice and vanilla. Pour into the prepared pan and let cool to room temperature on the counter. Chill until set in the refrigerator and cut into squares. Keep in the refrigerator until ready to eat as it softens very quickly.